Could your child have a math learning disability? Dyscalculia is a learning disability in math. People who have dyscalculia have trouble relating what numbers are to the quantity they represent. They may also have trouble recognizing patterns, an essential part of understanding how to do basic math operations. While researchers are still exploring the cause of dyscalculia, it is believed to be a brain-based condition. Children and teens with dyscalculia struggle to understand numbers and how to do math. Their struggles may lead them to avoid math, and develop math anxiety. Math is included in many parts of life, even for young children. However, with proper identification and educational strategies, people who experience dyscalculia can go on to be successful in school and in their personal lives. Different educational professionals and researchers may use the terms dyscalculia and math learning disabilities in different ways. Some professionals will strictly define dyscalculia as a specific learning disability that affects the ability to connect the name of a number with a specific quantity. Others will include other number and quantity related difficulties, such as understanding the passage of time or a difference in quantity (greater than vs. less than) as dyscalculia. 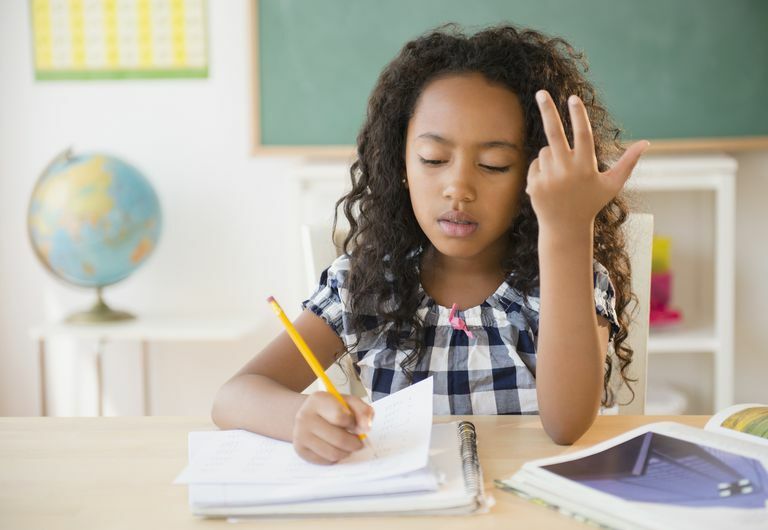 Professionals who narrowly define dyscalculia would consider difficulties with quantity and time as math learning disabilities. It is important for you as a parent or teacher to understand exactly what difficulties your child experiences with math when a math-related disability is found, so that the proper educational strategies can be used to help the child gain math skills. Dyscalculia differs from a dislike of math or finding math boring. While many children and teens find math challenging, children with dyscalculia will have extreme difficulty with particular foundational skills that will be needed to progress through future math classes. These specific difficulties will be present throughout a child or teen's life. They will not suddenly appear in a higher grade. Occasionally children will be identified in a higher grade as having dyscalculia, but struggles with specific math skills will always have been present. The exception to this is following a serious brain trauma, which may result in the sudden appearance of a math disability. Fortunately, there are many strategies and techniques that can help children and teens with dyscalculia become successful in math. The key to getting the right help is to identify whether a child or teen has dyscalculia, if there are any other learning issues, and the specific ways that dyscalculia affects the individual. Inability to connect a number quantity to the number of objects; For example, you ask your 4-year-old child to place three forks on the table and they simply grab as many as their hand allows. Difficulty understanding the passage of time; For example, your child may complain that they have been sitting down to eat dinner for hours when in reality they have been at the table for a few minutes. Have difficulty with sorting activities. For example, they may have trouble sorting items by color, by shape, or by type of object. Spend an unusually long amount of time on math homework, and other homework that involves math skills, directions, estimating, or measuring. Become nervous about remembering which class they are supposed to be in at which time. This can be especially difficult in schools with varying schedule days. Talk with your child's teachers or primary medical provider if you suspect your child may have dyscalculia or a math-based learning disability. It will be important to get a thorough, professional evaluation of your child's skills. A thorough evaluation will identify what specific math skills your child struggles with. Dyscalculia can also be easily confused with other learning disabilities or learning issues, such as ADHD, math anxiety, and dyslexia. Sometimes a child may have a combination of more than one, such as dyslexia and dyscalculia. The evaluation should help to identify and eliminate other possible learning issues, leaving you with the information that you need to help your child access specialized learning help at school. Schools and teachers have become more aware of dyscalculia in recent years. Still, you may need to be prepared to advocate for your child at school. The information in your evaluation will help you to explain to your child's school exactly what causes your child's struggles, so you can work with the school to find ways for your child to succeed. If your child is found to have dyscalculia or a math learning disability, they may qualify for Special Education services that would be specified in an IEP. You can request to have your child evaluated for Special Education services by asking in person or in writing at your child's school. Many of the learning strategies recommended for students with dyscalculia focus on multi-sensory, concrete learning methods. Children and teens may learn methods of counting out facts while doing a mathematical problem such as in the program "Touch Math." Higher level math courses, such as algebra and beyond, may use formula notes and focus on a deep understanding of math operations. Math and numbers show up everywhere in our daily lives. If your child struggled to learn these concepts, their self-esteem may have taken a hard hit. Be sure to remind them that they can succeed in math with new strategies and ideas. With an accurate assessment and good support, your child will be able to overcome those issues. Having dyscalculia does not mean that your child or teen has less overall intelligence. Learning how to adapt when faced with challenges is part of developing a growth mindset. A growth mindset is an attitude that success comes to those who work hard at learning over the long term, rather than believing the myth that those who are successful are born with the knowledge needed to succeed. Frye, D. "What Does Dyscalculia Look Like in Children? "ADDitude Magazine. New Hope Media,Web. 28 Mar. 2017. Kaufmann, L., & von Aster, M. The Diagnosis and Management of Dyscalculia. Deutsches Ärzteblatt International, 109(45), 767–778. doi:10.3238/arztebl.2012.0767. 2012. Morin, A. "Understanding Dyscalculia." Understood.org. National Center for Learning Disabilities, n.d. Web. 11 Jan. 2017.